During the month of August I attended two professional development activities for association executives. When I was an assistant superintendent in a district with about 27,000 students for 18 years, I had no idea there was a whole career path for association executives. Just as you have been encouraged to join YOUR professional association — the Council of Administrators of Special Education, a division of the Council for Exceptional Children, I was encouraged to join the American Society of Association Executives. And just as there are 38 state and provincial subdivisions of CASE, there are state groups for ASAE so I also joined GSAE! Just like CEC and CASE, ASAE has annual meetings and publications. All designed to help the association executive be the most effective and efficient leader for their association. I learn so much not just from the wonderful speakers and the breakout sessions — but just like the CASE events, I learn the most from networking with my colleagues. What do we talk about? How to engage members, increase membership, give more value to our members, make our meetings more meaningful, and over all how to better meet the mission and purpose of our association. In other words, what can I learn to be able to help make CASE even better. I came back from 2013 ASAE meeting in Atlanta — I didn't have to go far this year — so excited, pumped up with new ideas, and ready to do a better job and ... I remembered that feeling. 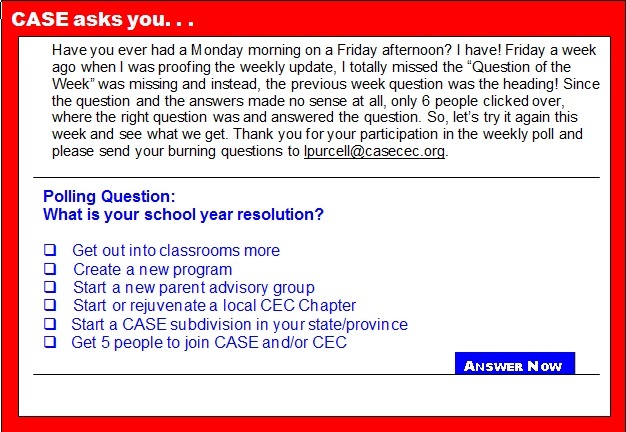 It was the same feeling I had when I was a local school administrator and I came back from any of the CASE and GCASE meetings. We all need our fuel tank filled up. As an administrator, you have to give so much to your staff, the schools, the parents, the community and the students. You need to get your gas tank filled occasionally so you will have the ideas, knowledge, energy and confidence to do your job at the level of excellence you are capable of doing. As you promote your teachers and staff to continue to grow, don't neglect your own personal growth. It isn't too late to register for the 24th Annual CASE Fall Conference: Lead Your Team To the Finish Line, in Indianapolis, Ind., Sept. 26-28. It isn't too early to begin thinking about your participation either on site or as a virtual site for the CASE Winter Hybrid Conference, Feb. 24-26, 2015. As you make plans for the 2013-2014 school year, don't neglect your own professional development! Recently, CEC announced Alexander T. Graham, a leading association executive, thought leader and long-time member of the disability community, will become executive director of the Council for Exceptional Children, effective Oct. 21. Recently, the U.S. Department of Education announced its intention to rescind the use of alternate assessments based on modified achievement standards, known as the "2 percent test" by the end of the 2013-2014 school year. The Department's proposal is available for public comment until Oct. 7 before becoming final. In 2007, the Department issued regulations which allowed states to develop an AA-MAS for students with disabilities who were not expected to reach grade-level proficiency and count up to 2 percent of student scores as "proficient" under the accountability system. The 45th annual PDK/Gallup Poll collected data from over 1,000 Americans ages 18+ regarding the approach to improving the educational system of America and the results showed a clear divide between policy makers and ordinary American citizens. The poll showed as many as 58 percent of Americans reject the notion of using student test scores to evaluate teachers and fewer than 25 percent believe increased testing will help the performance of local public schools. Last week, a newly updated site for the Education Resources Information Center was launched. ERIC is an online digital library of education research and information. ERIC is sponsored by the Institute of Education Sciences of the United States Department of Education. The mission of ERIC is to provide a comprehensive, easy-to-use, searchable, Internet-based bibliographic and full-text database of education research and information for educators, researchers and the general public. This resource contains more than a million records and links to hundreds of thousands of full-text documents from ERIC back to 1966. Dyslexia is the most common learning disability, affecting one out of every five children. Most people who have it are never formally diagnosed. It's an invisible problem that makes school incredibly challenging for millions of children, many of whom aren't getting the services and support they need. While schools are required to provide academic support for students with disabilities, a new study suggests the nondisabled siblings of disabled students may also be academically at risk. Those brothers and sisters are 60 percent more likely to drop out of school than students without disabled siblings, according to a University of California, Riverside, study, presented at the annual American Sociological Association conference here. Moreover, sisters of disabled students are particularly disadvantaged. They complete one-plus years less schooling than girls with nondisabled siblings. Recently, leaders from the worlds of special education policy, research, and practice gathered in downtown Washington, D.C., for the annual IDEA Leadership Conference. The meeting's agenda featured a wide range of discussions about how various policies and programs — from preschool participation and teacher preparation to extracurricular activities and accountability policies — could help to support the development of students with disabilities. Conspicuously absent from the agenda was any focused discussion of career and technical education. Dyslexia is the most common learning disability, affecting one out of every five children. Most people who have it are never formally diagnosed. It's an invisible problem that makes school incredibly challenging for millions of children, many of whom aren't getting the services and support they need. "Science has made a great deal of progress in understanding dyslexia, but it hasn't been translated into practice as much as it should be," according to Dr.Sally Shaywitz, co-director of the Yale Center for Dyslexia & Creativity and a professor in learning development at the Yale University School of Medicine. The U.S. Department of Education wants to do away with a rule that allows states to count some students with disabilities as academically proficient even if they do not meet grade-level standards. In a proposal published in the Federal Register, the Education Department formally signaled its intention to end what's known as the "2 percent rule." Under the current policy, some students with disabilities are tested under modified academic achievement standards. States are allowed to count as many as 2 percent of all students as proficient under the No Child Left Behind Act for taking such alternate assessments. The Secretary of Education Arne Duncan writes: "The nation's most sweeping education law — the Elementary and Secondary Education Act of 1965, better known as No Child Left Behind — is outmoded and broken. Congress has gone home for its summer recess without passing a responsible replacement. That's too bad. America deserves a better law. At the heart of No Child Left Behind is a promise: to set a high bar for all students and to protect the most vulnerable. Success in that effort will be measured in the opportunities for our nation's children, in a time when a solid education is the surest path to a middle-class life. Tight global economic competition means that jobs will go where the skills are. Raising student performance could not be more urgent." In the wake of the U.S. Department of Education's decision to place three states on "high-risk status" for problems with their No Child Left Behind Act waivers, it's clear that the federal push to grant states sweeping flexibility in school accountability will be fraught with stumbles. Implementing teacher evaluations tied to student growth is a significant sticking point for many waiver states, including Kansas, Oregon and Washington — which were formally warned by federal officials Aug. 15 that they might lose their waivers if they don't get new evaluations back on track. As Secretary Duncan has noted, the Department of Education is committed to making sure that all of our young people grow up free of fear, violence, and bullying. Bullying not only threatens a student's physical and emotional safety at school, but fosters a climate of fear and disrespect, creating conditions that negatively impact learning — undermining students' ability to achieve to their full potential. Unfortunately, we know that children with disabilities are disproportionately affected by bullying. At a time when most U.S. public schools are implementing the Common Core State Standards, a new report finds that Americans don't know what the Common Core State Standards are, and that they say more testing is not going to help students. These are just some of the findings of the 45th annual PDK/Gallup Poll on the Public's Attitudes Toward the Public Schools — the longest-running survey of American attitudes toward education, providing an extensive repository of data. It's the time of year when learning seems remarkably possible. Students are excited, teachers are motivated — let the learnfest begin. But by next month, it will become clear once again that the teaching/learning routine is a tricky dance, that all kinds of things, both in our heads and in our lives, can knock it off balance. Fortunately, scientists have kept busy analyzing how and why people learn. Here are 10 examples of recent research into what works and what doesn't. Is it time to get rid of IQ tests in schools? Schools have long used IQ tests to group students. But some experts say labels like "gifted" or "disabled" are following students throughout their education — for better and worse. Guest host Celeste Headlee finds out more. Most children experience some degree of apprehension and excitement as the first day of school approaches, but what does it mean when a child is overcome with fear at the thought of separating from parents and caregivers to go to class? This overwhelming fear may be a sign of separation anxiety disorder, a condition characterized by a school-aged child's extreme fear and nervousness of separating from loved ones. Research indicates that it is becoming more common to identify kids with Attention Deficit Hyperactivity Disorder, inattentive type during the middle school years. While ADHD is more predominant in boys, the inattentive type is more common in the subset of girls diagnosed with ADHD. ADHD inattentive type is also trickier to detect which is why it often goes undiagnosed until middle school. Tweens diagnosed with ADHD inattentive type have difficulty remaining focused, they are often not detected in elementary school where the tendency is to focus on each classroom task for short periods time.